Crisis, Conflict and Critical Diplomacy: EU Perceptions in Ukraine and Israel/Palestine (C3EU) - focused on EU images in key issue areas of economy, politics, foreign policy, energy, climate change, RS&I, civil society and culture/education. C3EU involves experts from leading EU perceptions studies and employs an internationally tested methodology to assess which EU messages resonate within divided societies and which target audiences are the most influenced by the EU. Framed by Strategic Narrative Theory, C3EU studies formation, projection and reception of EU narratives in Ukraine and Israel/Palestine. Policy- and solution-oriented, C3EU longitudinal perceptions analysis covers the period from Euromaidan and ATO (Ukraine) and Operation Protective Edge (Israel) (2013-16) and informs about internal and external EU narratives disseminated in Ukraine and Israel/Palestine – for which audiences and with what reception. C3EU will trace external views on the EU’s: exit from its crisis; new leadership; response to the Ukrainian and Israeli/Palestine conflicts; attraction as a destination for migration, investment, business and education; appeal as an effective Normative Power; structural support and civil society outreach; current and future critical diplomacy when dealing with Ukraine and Israel/Palestine; and role as a legitimate and credible partner. Initiatives to improve EU perceptions in conflict situations. C3EU employs an innovative comprehensive approach using tested qualitative and quantitative methods to generate an accurate assessment of EU diplomatic engagement with Ukraine and Israel/Palestine under crises and provides a comprehensive avenue to improve EU perceptions. Ultimately, C3EU will provide EU stakeholders with unique information to elaborate relevant policies and devise outreach initiatives to influence target audiences in the most effective and cost-efficient manner. Dr. Yevheniia Hobova, the Far East department of A. Krymskyi Institute of Oriental Studies, National Academy of Sciences of Ukraine. Assoc. Prof. Anastasiya Pshenichnykh, Karazin Kharkiv National University, Ukraine. Prof. Ben O’Loughlin, the New Political Communication Unit, Royal Holloway, University of London. Prof. Alister Miskimmon, Queen’s University, Belfast. 2004 - The 8th summit (Hague) - the status of a neighborhood country within the European Neighborhood Policy. 600 million Euro each year for… And so? PDF Private ownership by Bashar El Masri Mainstream. Daily. Regular editions on weekends as well The 2nd on the West Bank. Exact Number is not available but less than 20 k.
On September 1-3, in Vilnius (Lithuania), Associate Professor Natalia Chaban, with Professor Martin Holland, led a research workshop and a meeting of senior partner of the international research project “Crisis, conflict and critical diplomacy: EU perceptions in Ukraine and Israel/Palestine” (C3EU) Natalia is heading. The Meeting was attended by all partners: Ukraine’s National Institute of Strategic Studies, Cherkasy National University and Kharkiv National University; University of Ben Gurion at the Negev (Israel), TU Darmstadt (Germany); University of Leuven (Belgium), Royal Holloway (UK), Vytautas Magnum University (Lithuania), and University of Toledo (USA). The project has entered its second year and currently involves 32 researchers from 11 countries. On April 18-21, the team of C3EU researchers met in Kyiv for the second Research Workshop within the framework of the C3EU project. The training took place in the Embassy of Lithuania to Ukraine. Meeting was attended by researchers and senior partners from Ukraine’s National Institute of Strategic Studies, Cherkasy National University and Kharkiv National University (Ukraine); University of Ben Gurion at the Negev (Israel); Vytautas Magnum University (Lithuania); University of Toledo (USA), and University of Canterbury (New Zealand). The team discussed interim results of the first three months in media data analysis – both teams have successfully completed daily monitoring and analysis for January-March 2016. The team also talked about the next tasks – next three months of media monitoring and newsmakers’ opinion analysis – and finalised the work plan till the next meeting in Vilnius on September 1-3. The media analysis Workshop was led by Associate Professor Natalia Chaban, Jean Monnet Chair and C3EU Leader. A Head of European and EU Studies at the University of Canterbury (New Zealand) and Deputy Director of the National Centre of Research on Europe (NCRE) at the same University, Natalia is also Adjunct Full Professor at the Research and Learning Institute of Foreign Languages (Cherkasy National University, Ukraine) and Adjunct Associate Professor at the Centre for Study of European Politics and Society (Ben-Gurion University of the Negev in Beer Sheva, Israel). The Workshop had several key objectives. Firstly, it aimed to introduce the media researchers to the study “Crisis Conflict and Critical Diplomacy: EU Perceptions in Ukraine and Israel/Palestine (C3EU)” by presenting its context, goals, key tasks and the project timeline. Secondly, the Workshop introduced C3EU researchers to the original media content analysis in order to ensure the correct application of methodology and consistency throughout the media analysis process. Thirdly, it aimed to identify and address any horizontal methodological issues cutting across different tasks of the project. Finally, the meeting served as a teambuilding activity, which facilitated networking among the members of the project team. The media analysis workshop took place at the Technical University of Darmstadt (TUD), Germany on November 15-19, 2015. The workshop was led by Associate Professor Natalia Chaban, Jean Monnet Chair and C3EU Leader. A Head of European and EU Studies at the University of Canterbury (New Zealand) and Deputy Director of the National Centre of Research on Europe (NCRE) at the same University, Natalia is also Adjunct Full Professor at the Research and Learning Institute of Foreign Languages (Cherkasy National University, Ukraine) and Adjunct Associate Professor at the the Centre for Study of European Politics and Society (Ben-Gurion University of the Negev in Beer Sheva, Israel). The workshop had several key objectives. Firstly, it aimed to introduce the media researchers to the study “Crisis Conflict and Critical Diplomacy: EU Perceptions in Ukraine and Israel/Palestine (C3EU)” by presenting its context, goals, key tasks and the project timeline. Secondly, the workshop ensured the correct application of methodology and consistency throughout the media analysis process. Thirdly, it aimed to identify and address any horizontal methodological issues cutting across different tasks of the project. Finally, the meeting served as a teambuilding activity, which facilitated networking among the members of the project team. The C3EU network acknowledges the importance of capacity building in the field of European Union integration. The training of young scholars (at young and early-career stage) is seen as the most important tool in the ongoing sustainability of this research field and the skills and materials developed as the core of this research training will ensure the continuation of scholarly research into European integration. The Launch Meeting had several key objectives. Firstly, it aimed to introduce the partners researchers to the study ‘Crisis, conflict and critical diplomacy: EU perceptions in Ukraine and Israel/Palestine (C3EU)’ by presenting its context, goals, theoretical frameworks, methods, key tasks, admin matters and the project timeline. Secondly, this meeting served as a teambuilding activity, which facilitated networking among the members of the Consortium. 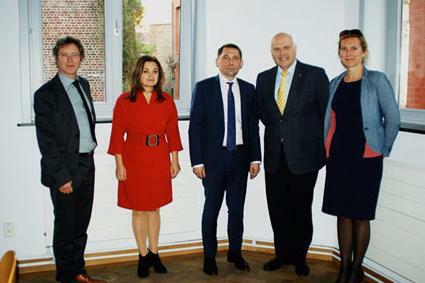 In accordance to the Project’s outline, a meeting with partners was held in Brussels, for two days, in the period from 8 until 9 November 2015. The workshop had several key objectives. Firstly, it aimed to introduce the partners researchers to the study ‘Crisis, conflict and critical diplomacy: EU perceptions in Ukraine and Israel/Palestine (C3EU)’ by presenting its context, goals, theoretical frameworks, methods, key tasks, admin matters and the project timeline. This meeting also served as a teambuilding activity, which facilitated networking among the members of the Consortium. 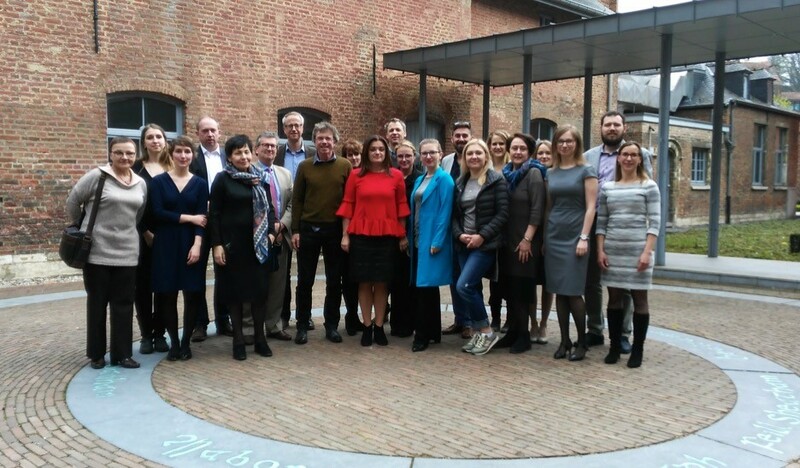 On April 20-22, in Leuven (Belgium), C3EU consortium held Research Workshop #4 as well as a meeting of senior partners. The Workshop’s programme featured reports on elite opinion analysed through the interviews with political, business, civil society and cultural decision- and policy-makers in Ukraine, Israel and Palestine, as well as with EU practitioners in Brussels. The Workshop also included preparation for the next stage of the project -- research training in q-sort method. The method is used to analyse youth opinion in Ukraine, Israel and Palestine, as well as in Germany. 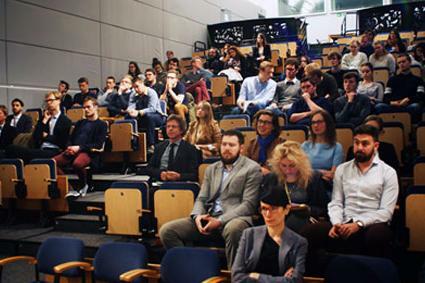 Research Workshop also featured a high-profile public event— a public lecture by the Ambassador of Ukraine in Belgium for the students and academics of the KU Leuven and C3EU Team. C3EU leader Prof Natalia Chaban also briefed the Ambassador about the main findings of the C3EU project. 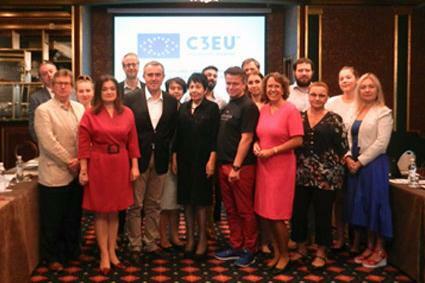 On August 24-26, in Kyiv (Ukraine), C3EU Netowork team had its Research Workshop #5. The Workshop programme included final reports on media analysis (using quantitative method of the Rasch Model), elite opinion analysis (quantitative analysis of narratives from a comparative perspective) and reports on the first results of the q-sort method used to assess youth opinion in Ukraine, Israel and Palestine and Germany (with various QN methods). Research Workshop #5 started a new phase in comprehensive data analysis informed by the comparative approach and synergies between theories and methods, and contributed to the development of policy recommendations. The Ambassador of Belgium in Ukraine presented to the C3EU team, adding to the discussion about C3EU’s contributions to the public diplomacy discussion. Iana Sabatovych met the researchers as part of post-workshop communication with. The meeting was dedicated to the planning of the interviews: review of the questionnaire, the making-up of the contact base and time-frame of the project. The targeted cohorts were determined as well as the ratio between local/regional elites and those representing the capital. The researchers, Associate Professor Natalia Chaban and Dr. Olga Gulyaeva met to discuss the pilot phase of the media data collection process, addressing questions on routing data gathering and analysis. Dr. Olga Gulyaeva delivered her observations of the collected data. Associate Professor Natalia Chaban discussed the upcoming initial phase of the project with the researchers. Associate Professor Natalia Chaban discussed further project’s development with the researchers. Associate Professor Natalia Chaban discussed further project’s development with the researchers, specifically the upcoming workshop at the Technical University of Darmstadt (TUD), Germany on November 15-19, 2015. Dr. Olga Gulyaeva introduced Google Drive that would assist in data collection. Associate Professor Natalia Chaban discussed further project’s development with the researchers, specifically the upcoming workshop at the Technical University of Darmstadt (TUD), Germany on November 15-19, 2015. Dr. Olga Gulyaeva introduced the media analysis protocol. This is a pilot study of media narratives focused on the referendum in Holland as to the approval of Ukraine’s association with the EU. The narratives are represented by randomly selected articles published in Ukrainian (80 articles) and Russian (70 articles) Internet blogs in March – April 2016. The analyzed temporal spans are: March 1 – April 5 (before the referendum), April 6 – 12 (the referendum proper and the subsequent decision of the country’s government), April 13 – 30 (after the government’s decision). The study aims to establish the focal narrative topics, their prominence and dynamics exhibited through time, as well as evaluation of these topics exposed through verbal and visual means. The narrative topics are arranged within a coherent conceptual ontology that structures information about the referendum and exhibits reciprocal relations between the involved participants. These relations, specified in the texts, are described in them with a certain degree of regularity, which demonstrates salience of topics for the narrators. The latter, as the confronting discourse parties, Ukraine and Russia, tend to display their attitudes and dispositions to the described events. The project is carried out by the faculty members and students of Bohdan Khmelnitsky National University in Cherkasy. The theoretical framework for data analysis is developed by Professor Svitlana Zhabotynska. The analysis of data within this framework is fulfilled by Associate Professor Valentina Velivchenko. The data have been collected by BA students of the School of Foreign Languages. This satellite project intends to provide an in-depth analysis of multiple metaphorical expressions (conventional and non-conventional) represented in Ukrainian media narratives dated January – June 2006 and focused on Ukraine – EU relations. Considered within the framework of cognitive linguistics, these metaphorical expressions are expected to reveal a limited number of basic conceptual metaphors typical of political discourse. When employed for portraying some referential domain, the relations between Ukraine and the EU in particular, such conceptual metaphors acquire specificity in both reflecting the events and creating their axiological planes. This specificity, as the major highlight of the study, is expected to be found in the target and source domains, as well as in their cross-mapping. the SOURCE domains of entities with which the targets are compared – their metaphorical scope defined by the number of targets on which the sources are mapped. The cross-mapping of the source and the target results in one or several conceptual metaphors represented by a metaphorical schema which is specified in various metaphorical expressions. The metaphorical scope of the source domain, the number of conceptual metaphors it creates, and the number of respective metaphorical expressions expose the metaphorical potential of the source, which in some cases displays the importance of a particular axiological plane. The project, which has theoretical and practical implications for both media studies and linguistics, is carried out by Prof. Svitlana Zhabotynska, Prof. Galyna Yavorska, and Prof. Olena Morozova. Anastasiya’s research looks into Ukrainians’ view of themselves, the European Union and Russia as presented in Ukrainian media discourse, namely, in social and political newspapers. Method: Ukrainian dailies’ and weeklies’ monitoring with the focus on both verbal and visual semiotic layers and their interaction. The research aims at generalizing on intersemiotic images of Ukraine-the EU-Russia triangle in the contemporary context as well as bringing to light the respective cognitive images, or the ways Self (Ukraine) and the Other (the EU and Russia) are presented by Ukrainian press. The starting point of the investigation is the formal analysis of photographic images of Ukraine, the EU and Russia involving visualization tools software for organizing the image data; the core formal qualities being analyzed are types of photographs, shots and shooting angles, composition, colour and a range of visual elements like light, focus, repetition, shape, texture and others which give form to the images under study. This serves as an access to what is “in” the form or interpretations of meaning: symbolism in photos, their connotations and metaphorical meanings, as well as types of resonance with the verbal text of articles and the creation of additional meanings resulting from the interaction of the two semiotic layers. The final aim is to elaborate cognitive images. For comparing and contrasting Ukrainian cognitive images of Self, the EU and Russia the cognitive theory of perspectives is used which helps to show the cognitive viewing arrangement changes depending on what object is focused on or framed. The visual and verbal image is analyzed in terms of differences in cognitive perspectival points, perspectival distance and mode, direction of situation scanning. In recent years, relations between language and society – a traditional concern of sociolinguistics – have been reconsidered, not least of all, under the influence of ideas borrowed from social, cultural and political studies. The view of language as a mere reflection of social interaction has been transformed to the comprehension of a constructive role of discourse in social change. European integration is a kind of social change which is propelled by discourse, and since ‘institutions play a vital role in reality construction’ (Mayr 2008: 3) of the European community, it is institutional discourse that is ‘endowed with the performative power to bring into being the very realities it claims to describe’ (Fairclough 2003: 203-204). The main question of Anna’s current research is how European integration is constructed and reconstructed by institutional discourses in the EU and in Ukraine in the context of the recently signed association agreement, while there is an ongoing conflict between Ukraine and the Russian Federation. In seeking an answer to this question, Anna engages the methodology developed by Natalia Chaban and her team for their C3EU project, along with a corpus approach to critical discourse analysis. In particular, Anna maintains that a systematic account of the perception of the EU in Ukrainian institutional discourse and the perception of Ukraine in EU institutional discourse will uncover similarities and discrepancies in the structure, sequence and coherence of discursive practices in Ukraine and the EU respectively with regard to European integration. The findings of this research will contribute to C3EU by assessing the communicative and strategic actions of the EU and Ukraine under crisis as they are constructed by institutional discourse. Yavorska, G. (2016), Мова як складник конфлікту [Language as an Element of Conflict]. Conference proceedings ‘MEDIA STUDIES: МЕЖДИСЦИПЛИНАРНЫЕ ИССЛЕДОВАНИЯ МЕДИА”, Kharkiv. Hobova, Y. (2016) Analytical report "Foreign Policy Audit: China-Ukraine", Institute of World Policy (with co-authors). Zhabotynska, S. (ed.) (2016) Когнітивна лінгвістика в міждисциплінарному контексті: теорія і практика [Cognitive Linguistics in Interdisciplinary Contexts: Theory and Practice]. Conference proceeding of the International conference UACLIP, Cherkasy National University, 8-10 October 2016, Cherkasy. Chaban, N. (2016) 'Eurointegration’: Narratives and Myths. Framing the EU by Ukrainian media. Prague, Czech Republic: ECPR, 7-10 Sep 2016. Chaban, N. (2016) Between Attraction and Resentment: Framing the EU in Ukrainian Media. Victoria University of Wellington, Wellington, New Zealand: Symposium "Evolving Institutions in Ukraine: A multi-disciplinary approach to post-Soviet space", 11 May 2016. Chaban, N. (2016) Cultural Filters of EU External Perceptions: To the Understanding of Domestic Factors in Fostering Democratic Advances (case-study Ukraine). Trento University, Italy: ECPR SGEU Conference, 14-18 Jun 2016. Chaban, N. (2016) Imagining the EU as a normative power: Framing the EU in Ukrainian media after Maidan. Tartu University, Estonia: Europe under Stress: The End of a Common Dream?, 12-14 Jun 2016. Yavorska, G. (2016), Мова як складник конфлікту [Language as an Element of Conflict]. Paper at the conference ‘MEDIA STUDIES: МЕЖДИСЦИПЛИНАРНЫЕ ИССЛЕДОВАНИЯ МЕДИА”, Kharkiv, Ukraine. Hobova, Y. "Using Cascading Framing Theory”, A. Krymskyi Institute of Oriental Studies NAS Ukraine. 1. C3EU Public Lecture by HE Mykola Tochytskyi, Ambassador of Ukraine in Belgium and Head of the Mission of Ukraine to the EU. HE Jacobs Luc, Ambassador of Belgium in Ukraine has attended the C3EU workshop #5 that also conincided with the celebration of the Independence Dat in Ukraine. In his speech, HE Jacobs Luc touched upon the topics of Ukraine-EU relations and the role that Belgium has or may have in this process.